The appeal of a memoir is typically one of empathy, of plunging and swimming inside in the life of another, becoming fully submerged in experiences far outside your own. At least, that’s always been the appeal in picking them up for me. It’s strange, then, that most renowned memoirs tend to be about lives whose experiences would devastate readers who try to become immersed; tragedy is seen as something we can learn from, something that can be understood and therefore prepared for, in case such horrendous events ever happen to ourselves. 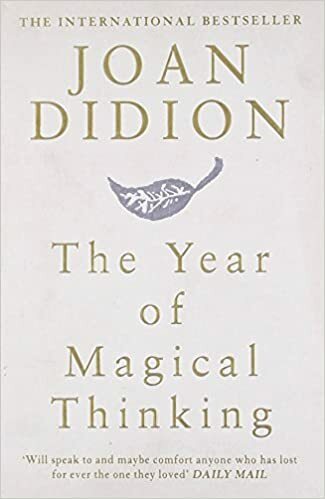 In The Year of Magical Thinking, however, Joan Didion accounts the first year of her life without her husband John Gregory Dunne, who died of a heart attack at the beginning of 2004, and explains her feelings of numbness and the absurdity of trying to learn something from a black hole called death that’s left you far weaker than you ever would have been had it not appeared. It’s a harrowing account, detailing the way grief erodes day-to-day experiences like an earthquake tearing apart the mantle of life. ‘I could not trust myself to present a coherent face to the world,’ Didion laments, and for a woman who values control as she does, this is truly damning. This isn’t a rational way of approaching things, I thought, but of course it isn’t; that’s why this book is so valuable: it shines a light on the irrational ways minds approach the world after tragedies, the strange thought-patterns that make sense to no one but yourself. Nothing about grief is rational, after all; it just is. To those looking for a salve to spread over the wounds caused by the departure of someone beloved, The Year of Magical Thinking may not be what you had in mind. It’s an brutal account of grieving that eschews sentimentality and looks the rawness of death in the face. It isn’t, basically, a comforting read. It is a valuable one, though, and anyone who has experienced a tragedy knows the value in seeing the world from the eyes of someone who feels like you do, even if that feeling isn’t positive. If melancholy could be said to have a patron saint, it would be Joan Didion. She travelled throughout California during the 1960s to try and understand what she saw as a confused and desperate time. Not the cheeriest subject, but interesting nonetheless. There’s despair, as this book describes a world of tumultuous change and violence—yet, reading it decades later, there’s also poignancy. We watch social movements grow and gather momentum when we know they will fizzle out and die, having accomplished few of their goals; this is a useful reminder of how difficult it can be to see all ends. Didion’s perspective on the 1960s is raw and fascinating due to its frustration. Popular culture often sides towards romanticizing Flower Power and the few moments of peace, but Didion reveals destructiveness unchecked naivete can cause. Hippies come across less as fantastical dreamers, and more like perpetually drugged up cliché factories desperate for the illusion of change in a society that seems fundamentally broken. There’s a moment in nearly every essay of Slouching Towards Bethlehem where Didion seems to lament the lost dreams of both her nation and the individuals who strive and usually fail inside it. The mood is of an extended eulogy for a land of moral decay which she doesn’t seem certain was ever better than now anyway. It’s the 1960s without the kaleidoscope of modern pop-culture obscuring the nastier elements, and thus a harrowing but powerful read.